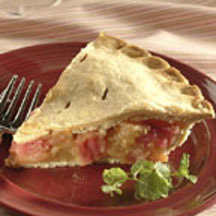 CooksRecipes has quality, kitchen-tested recipes for a variety of rhubarb pies that you can count on for successful deliciousness. 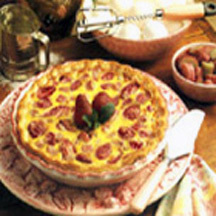 Strawberries and rhubarb are coddled in a mild, almond-flavored custard and baked until tender in a pastry crust. Rhubarb lovers will be sure to ask for your recipe when served this tangy combination of apples and rhubarb.